Adrian Jewell introduces his magic Wands! 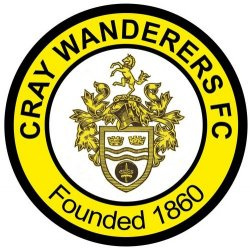 Adrian Jewell shows us around Hayes Lane, whilst looking forward- hopefully- to Cray Wanderers not being there for too much longer! It has to be Michael Power equalising goal in the Trophy game at Moneyfields on a cold evening down in Portsmouth. Made the long journey worthwhile. Obviously losing in the playoff to Walton Casuals after the players had given us a season to remember, scoring over a hundred goals. We have kept the core of last seasons players and added a bit of quality to the team so hopefully we will be in with a shout. In Russell we trust! Guernsey is always a good trip - something different than your normal away day routine. Also looking forward to the trip to Canvey Island in the Trophy - nothing like a bit of Kent v Essex rivalry. Although we haven't played there for a while, for me, Whitstable Town. A lovely part of Kent. Thamesmead Town and Greenwich Borough, purely due to player and manager movement between the clubs. Also with Greenwich Borough we have the battle of the drums and flags, although our flag collection is second to none. This is a difficult one as we ground share with Bromley. The ground itself is very neat and tidy. The pitch is a 3G surface so match will be guaranteed to go ahead whatever the weather and feel free to sing along with The Wanderer played when the teams come out. As we receive no monies from bar takings please buy a match day programme price £2 or a Golden Goal ticket, price £1 as this is our only additional revenue on match day. For me it has to be Ross Lover. He just made the game look so easy.  Bostik Supporters Predictions 18/19: Hayes & Yeading United Corey Eaton is rather confident. Actually, he's supremely confident. Hayes & Yeading Utd are promotion certainties!